(Bloomberg) -- Donald Trump is considering the removal of more top officials at the Department of Homeland Security after demanding the resignation of Secretary Kirstjen Nielsen, as he purges the agency out of frustration over a spike in illegal border crossings. The White House announced Monday that Secret Service director Randolph Alles would leave the administration, joining Nielsen, who announced she would resign effective Wednesday. 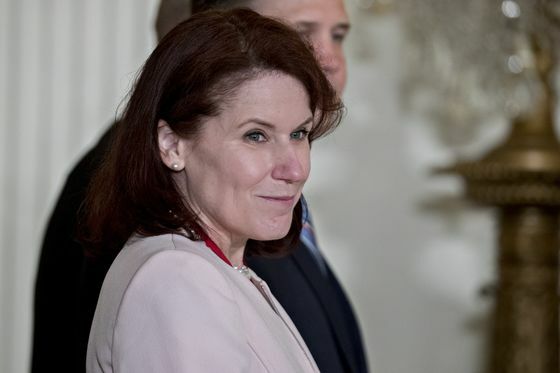 DHS Undersecretary for Management Claire Grady is likely to be removed or reassigned to clear the way for Trump’s preferred replacement for Nielsen, Customs and Border Protection Commissioner Kevin McAleenan. The reshuffling at the department, perceived to be the work of Trump’s freshly empowered hard-line aide Stephen Miller, has alarmed many of the White House’s Republican allies -- even those who share the president’s desire to crack down on undocumented immigration. They questioned whether Trump has a plan to control the U.S. border with Mexico, where more than 66,000 migrants were apprehended in February alone, or if he is only adding to a long list of vacancies in the top ranks of the government’s immigration agencies. Trump also risks damaging political relationships. Cissna is a former staffer for Senator Chuck Grassley, and the Iowa Republican said in a tweet that he’s doing “an excellent job” at DHS. Some Trump advisers said it would be unwise for the president to cross the senator. Miller is eyeing other people in the government who were hired after recommendations or referrals by Nielsen or former White House Chief of Staff John Kelly, two people familiar with the matter said. Kelly preceded Nielsen at DHS and recommended her as his replacement. He departed the White House late last year after repeated clashes with the president. Senator Dianne Feinstein, the senior Democrat on the Judiciary Committee, said in a statement that at least 10 top positions at Homeland Security are vacant or filled by people in an “acting” capacity. They include the secretary, who is resigning Wednesday, as well as the deputy secretary, ICE director, Federal Emergency Management Agency administrator, inspector general, undersecretary for policy, undersecretary for science and technology, chief financial officer and chief privacy officer, she said. Many officials departing the administration were regarded by Trump and his advisers as either career bureaucrats or loyalists to Kelly who were unwilling to enact politically controversial or legally dubious policies demanded by the president. The reverberations are sure to be felt throughout the sprawling bureaucracy. “I am concerned with a growing leadership void within the department tasked with addressing some of the most significant problems facing the nation,” Senator Ron Johnson, the Wisconsin Republican who chairs the Homeland Security Committee, said in a statement. Nielsen, in a statement on Monday night, praised Alles’s leadership at the Secret Service. But at the White House, officials signaled that they expect the dramatic turnover to produce equally dramatic results on the southern border, where the largest surge in migration since 2014 has outraged the president, threatening to undermine his central campaign promise headed into his campaign for re-election. Migrant apprehensions in February increased by more than 18,000 from a month earlier, and Nielsen has said that nearly 100,000 people would be caught crossing the border in March. Most of them are families or unaccompanied children. The White House hopes McAleenan’s appointment will “lead to some massive changes along the southern border,” spokesman Hogan Gidley said Monday. Separately, Trump has been mulling for at least the last week the appointment of a possible immigration “czar” for his administration, according to multiple people familiar with the matter. The hope is to appoint an official that the president and his top advisers believe can accelerate his policies, including construction of more border wall. The people asked not to be identified because Trump’s plans aren’t public. People Trump has discussed as he’s considered filling high-ranking immigration positions include former Kansas Secretary of State Kris Kobach and former acting director of Immigration and Customs Enforcement, Thomas Homan, who is a favorite of the president and Miller, according to two people familiar with the matter. One person said former Acting Attorney General Matthew Whitaker has also been mentioned. Homan said in an interview with Bloomberg Radio that he would “take the call” if he was asked to discuss replacing Nielsen or becoming immigration czar. But he said shutting down the U.S. border with Mexico should be a “last resort” to control migration. The hard-line faction within the White House, led by Miller, expects that new, more ideologically-aligned advisers can implement some of the more dramatic measures the president appears willing to take to stem the tide at the border. CNN reported on Monday that Trump wants to stop allowing migrants to claim asylum in the U.S., and that Nielsen had tried to explain to him -- in vain, as it turns out -- that such a move wouldn’t be legal. NBC News and CNN also reported Monday that Trump desires to reinstate a policy that led to the separation of thousands of migrant children from their families last summer after they crossed the border. The separations caused broad outrage in Congress and among the U.S. public, but Trump believes the policy deterred migrants from trying to enter the country, CNN reported. He signed an executive order in June to end the practice after a federal judge ordered the administration to better account for the children and to reunite families. Separately, a court ruled on Monday that the Trump administration can’t force migrants claiming U.S. asylum to wait in Mexico while their immigration cases proceed, a policy Nielsen tested late last year and had sought to expand. White House officials wouldn’t confirm that Trump wants to reinstate family separations but acknowledged he wants to modify a decades-old legal settlement so that the government can detain migrant families together for longer periods of time. Late last month, Trump threatened to fully close the border with Mexico, only to retreat later after economic advisers showed that a sustained, full-scale closure of border crossings could damage the U.S. economy. Trump was presented with economic models that showed a “pretty strong” impact if freight between the two countries was halted, White House economist Kevin Hassett told reporters on Monday. Trump may face other legal challenges in his bid to reshape the Homeland Security department. His decision to promote McAleenan contradicts federal law that puts Grady, the department’s undersecretary for management, next in line for the job. “I strongly urge you to follow the law in this matter and to nominate a suitable candidate for secretary as expeditiously as possible,” the chairman of the House Homeland Security Committee, Democrat Bennie Thompson of Mississippi, wrote to Trump on Monday. Trump aides have said the president wanted McAleenan to lead the department because of his knowledge of immigration issues. Grady’s government service has focused largely on defense procurement and acquisition. “Kevin wants to implement what the president is pushing,” Gidley said.